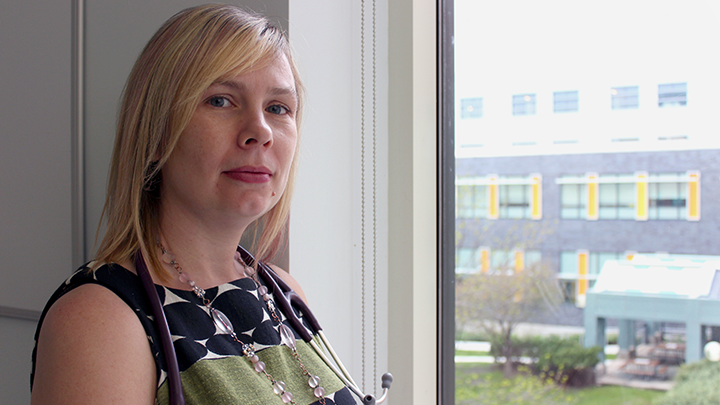 “I feel that all people should be able to have a good death however they perceive it to be, and to have access to that where they live,” says Dr. Dionne Walsh, Physician Lead for Medical Assistance in Dying (MAID) for South Zone of Alberta Health Services. Dr. Dionne Walsh had always wanted to be a family doctor, but her Lethbridge practice took an unexpected turn after about seven years. She loved family medicine, as she knew she would, especially the opportunity to get to know her patients well over long periods of their lives. “But I found that I really enjoyed caring for patients with incurable illness, and those near end of life,” says Walsh. “Providing palliative care, following people I knew and journeying with them and their families through that time in their life. When she learned that Medical Assistance in Dying (MAID) would become legal in 2016, Walsh felt compelled to get involved. She believed strongly that MAID should be available to terminally ill people as an option — and that it should be available in their home community. At the same time, she was mindful of all there was to think about. Walsh was out of town when the first call came, but when the second call came, she was available. “It’s not an emergency when a patient inquires about MAID,” she says, “but it is very urgent to the patient and the family because they’re suffering greatly. It’s of a timely nature. When I was going to the patient’s home I was feeling very anxious and preparing myself. I had read her chart. I knew that I would most likely find her eligible by the criteria of the law. As I was driving there, the tailgate of a truck in front of me opened, and large pieces of wood dumped out right in front of me and I had to stop very quickly. Everything was fine; I pulled around and I waited and no one was hurt. But at the next stop it really made me pause and think — am I really meant to continue on this journey? I needed to be very intentional then that I wanted to continue. “When I met the patient and her husband it was just almost relaxing. My anxiety was gone because they were so forthcoming in sharing their story of how they got there, and all the time they spent thinking of all this, and the suffering she had. Her husband was very supportive of her wish. Very sad, but supportive. After finding her eligible, I felt comfortable to also be the providing physician for her, and the experience cemented my feeling that this is a very peaceful and honourable way to die if a person chooses it, and to continue following on that path. It didn’t take long before helping the dying began to trump healing the living, and two years ago Walsh made the decision to close her practice. “Now I’m a palliative care consultant and no longer have my own patients. I see patients in their homes, in the hospital, at St. Michael’s Health Centre in the palliative care unit. I do some rural work. I think I just love being with people and hearing their stories. During the time that we have in palliative care with our patients — we take the time to hear those stories. I think that’s where I get my joy from. No one knew quite what to expect in terms of demand after MAID became legal. Walsh expected an initial flurry of requests from people who might have been waiting, followed by a settling down of demand. “We can look at a place like Oregon to try and predict what the experience might be here, but their law is quite different than ours in terms of who is eligible. In the Netherlands four- to five-per-cent of deaths are by MAID and they have a similar law, but they have a different culture and have had this type of death occurring for many years. In Alberta in 2017, one per cent of deaths occurred by MAID. In South Zone, there have been 66 MAID deaths since the law was passed in June 2016. With growing demand, there’s a need for more physician providers in order for the MAID team to continue to see patients promptly and honour individual preferences for place and time. Interested in becoming involved in MAID? Please email Dionne.Walsh@ahs.ca.